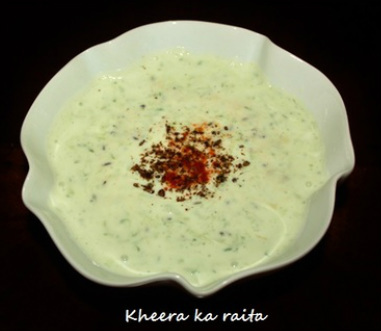 ﻿K﻿heera ka raita (cucumber raita) is very cooling refreshing and one of the most popular raita. It is a delicious side dish with any hot curry. Cucumber is popularly known as kheera in India and usually eaten as a salad and with yogurt as a raita. Cucumber ka raita is made with grated kheera and yogurt and seasoned with mustard seeds, cumin seeds and asafetida Tadka. Grated cucumber blends well with the yogurt. Kheera ka raita is a healthy and very easy and quick to make dish, you can served it for lunch as well as dinner. It tastes especially good with stuffed parathas, biryanis and pulaos. 1. Peel the cucumber and grate it with a grater. cumin seeds tadka and salt, mix everything together. 1. Instead of grating the cucumber you can fine chop the cucumber. 3. If you wish you can grate the cucumbers with skin.